Yes, you CAN have it all! Experience the magic of the French countryside in this charming, roomy, lofty apartment in a 250 year old country, stone farmhouse. Located just 15 minutes away from Amboise, one of the most visited cities in France, it’s the perfect starting point for an enchanting discovery tour of France’s glorious historical past. The Loire flows majestically through this historical castle-studded valley, recently listed as one of the UNESCO World Heritage Sites. Fields and forests are the views from your cozy nest. The farmhouse loft has just been renovated, with a new kitchen, and a new inviting cool blue swimming pool. With leafy gardens around, the pool is perfect for cooling off if you are here in the summer. Deck chairs are provided. A separate entrance with a sturdy staircase takes you up to the spacious 2 bedroom loft (900 square feet), where you will marvel at the beautifully exposed, original, rough-hewn beams and stone walls. The main bedroom has a California King sized bed, and includes a sitting area, and 2 windows looking over the Valley. The large, dormer window, glassed entrance, and round oeil-de-boeuf window in the second bedroom, flood the room with soft light and provide a pleasant view of the original 16th century well, and farmhouse grounds. This bedroom has a double bed, and is separated from the salon and kitchen area by French doors. The spacious living area includes 2 sofas (one becomes a double bed), and flat screen TV, with international channels included. The new and modern bathroom with its comfortable, large oval soaking tub/shower stands in harmony with the ancient beams and angled walls. We enjoyed searching high and low for the antique furnishings. The functional kitchen is equipped with cooktop, oven, microwave, drip coffer maker, refrigerator, dishwasher, and all you'll need to create meals from the fresh meats and produce found in the local, open markets. There is a full sized washer/dryer combo (washing machine that also dries). ​​​​​​​There is a dining table which seats 4. This lofty apartment is equipped with WiFi and Free Long Distance phone calls. If you are here in the spring, summer or fall, you, too, can explore the local vide greniers (community garage sales) or the many antique stores in the area. Treasures can be found! Explore Amboise, only 15 minutes away, with it’s fortressed walls, ancient clock-tower, the Royal Chateau d’Amboise, and the special jewel, Clos Luce, the magnificent home where Leonardo da Vinci spent the last years of his life, now a museum and tribute to his genius. Just 30 minutes away by car or a delightful bike ride is Chenonceau, the darling of the Loire Valley Chateaux. Nearby, Chambord with its many turrets or Vilandry, with its amazingly beautiful ornamental gardens of colorful vegetables should be next on your agenda as they shouldn't be missed. Wine enthusiasts will also be delighted by and abundance of wine tasting cellars in the area-Vouvray, Chinon, St Nicolas de Bourgeuil, Sancerre, etc. Local wine estates welcome visitors. If you’re the outdoor type, one of the longest and most picturesque bicycle trails in Europe as well as section of the Grande Randonnee (France’s answer to the John Muir Trail) pass through Amboise, for your cycling and hiking enjoyment. Bicycles can be rented from several locations in Amboise or if you bring your own, we can shelter them in our barn. You can visit the twice-weekly open-air market in Amboise, along the Loire, and pick up something delicious to eat. If you had your big meal in the afternoon, as the French do, you can enjoy a simple light meal at home, with a crusty baguette from our village bakery, that you've picked up fresh-baked in the morning, or you can purchase a sampling of Madame Bodet's (our neighbor) chevre (goat) cheeses, which this region in France is known for, or buy sausages and other meats from the local animal reserve, Beaumarchais. Your meal will be complimented with a robust red wine or sparkling, slightly fruity Vouvray from one of the many local wineries. Feel like going out ? Our village is the home of the Restaurant Auberge de la Brenne, renowned for its gastronomical sampling of local specialties. There is also a plethora of restaurants in all price ranges from country casual to city elegant, within 20 minutes of the farmhouse and we’d be happy to recommend some to you. 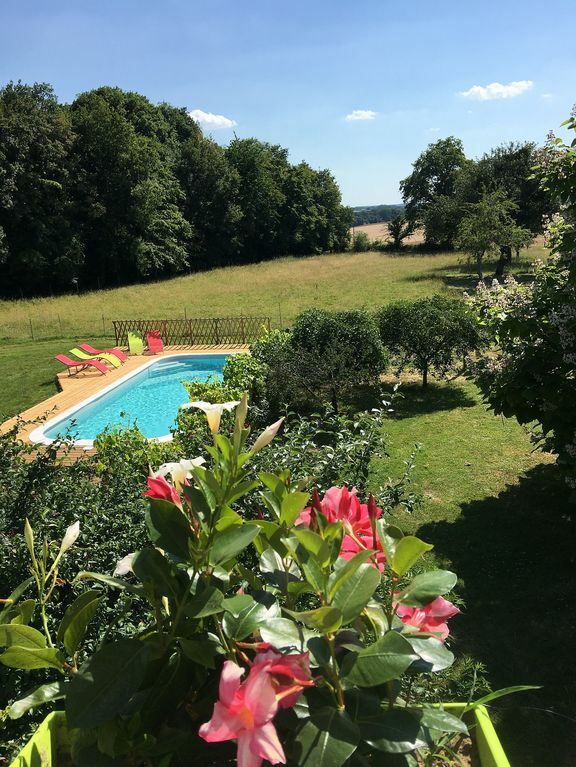 The charming French owners of this historic, stone farmhouse, Muriel & Michel, are glad to offer assistance by pointing you in interesting directions. They hope to make your stay not only one you will long remember, but one you will long to return to, time and time again ! Please ask about renting one of many unique Paris rentals : studio, 1 bedrooms, 2 bedrooms. My husband and I stayed for 4 nights in September. Found it a little hard to find but what a treasure when you do! A beautifully furnished and clean apartment/loft, beautiful surroundings - better than the photos. Veronica and Steven were very kind, more than helpful in answering questions/concerns. Loved the delicious fresh tomatoes from the garden which Veronica kindly let us pick, also raspberries, chard and beetroot. It is a little out of the way, about 15 mins from Amboise, but a pleasant drive. Lots to see and do, 4 nights wasn't long enough. Absolutely recommend it! My wife and I stayed here and it was fantastic. When one thinks of a farmhouse loft in the French countryside, one thinks of a place like this. A beautiful location and so much nearby! Plenty of space to go for walks in the day, easy access to Amboise and the many castles of the Loire Valley. The hosts are very gracious and extremely helpful. The loft is absolutely wonderful--spacious and clean. The amenities were perfect; "normal" plumbing (for an American) and enough media access to get connected the few times we needed to. Just a wonderful place and a wonderful experience. I can't imagine that there's anything better. The famous Chateaux of the Loire Valley, many with summer sound and light shows, Amboise, Chenonceau, Chambord, Blois, Chaumont, Azay-le-Rideau,Villandry, to name a few, Leonardo da Vinci's home/museum in Amboise and numerous museums, monuments, and open-air markets in Tours, There are many recreational attractions as well, the aquarium, the mini-chateaux, Fantasy Forest (a children's amusement park), a wild-life park and horseback Riding, and swimming within fifteen minutes of the house, Dining out becomes a fine art with many nearby restaurants in all price ranges, from the deliciously simple to the gastronomical splurge, In the heart of Vouvray Wine country as well as all the different varieties of Loire Wine--Chinon, Bourgeuil, Sancerre, etc., For the shoppers, there are many gift and specialty shops, as well as antique shops in town, Check the activity calendar for special town fairs with their parades, medieval jousts, and the wonderful vide-greniers (village-wide flea markets) during Spring, Summer and Fall.